Picking up on the theme of “elder influence” it si good to remember that there is nothing new under the sun. The idea that elders form a kind of human bridge that spans both time and the human generations is well known to the people of many cultures. The Turtle Lodge represents this bridge of influence in action, it’s worth a look. Excerpts below. The protocol of elder influence was reflected in the gathering, as it had been in the old days. As the elders led the gathering, we felt at ease, knowing and feeling that things would run the way they were meant to be. To the elders, the beginning of the day was always most important and that was giving thanks and gratitude to the Great Spirit and the Grandfathers. During the four days, little baby turtles kept appearing; this would happen on each day. Each day they would be taken to the river, and released. This one day, a little turtle was found and it seemed that it was not alive, so it was decided it would be taken back to the shore of the river. This was when the evening healing ceremony was about to begin. As the little turtle was about to be laid on the shore, the sound of the drums beating began in the Elder’s Lodge. Suddenly, one eye of the turtle opened. It was alive, but it seemed barely alive. As it was laid on the ground, and the drums were beating in the lodge, the baby turtle immediately came alive and ran towards the sound of the drums. This again offered a sign to the people. The little turtle represented the child, and we were all being shown that somehow we are destroying the spirit of our children. 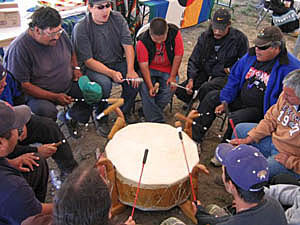 When the little turtle came alive and went towards the sound of the drum, what this meant, the elders said, was that the drum represented the awakening to a way of life that could nurture and help build the spirit of the children. The drum was calling for everyone to return to the sacred lodges, and sacred sites of our people.